The coastal cliffs that line Powderhorn’s eastern shoreline have been pummeled by some of the most severe storms in American history. The 19th-century port of Indianola once boasted more than 5,000 residents. 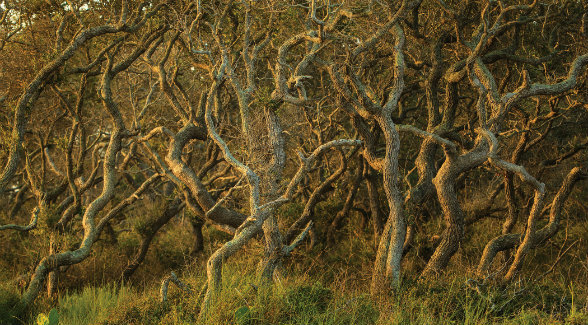 Located on the north side of Powderhorn Bayou, it was abandoned after hundreds perished in hurricanes in 1875 and 1886. Years of patience and persistence pay off, thanks to a multi-partner coalition and a gracious steward. Last August, a decades-long endeavor finally bore fruit when a multi-partner coalition announced the acquisition of Texas’s 17,351-acre Powderhorn Ranch. 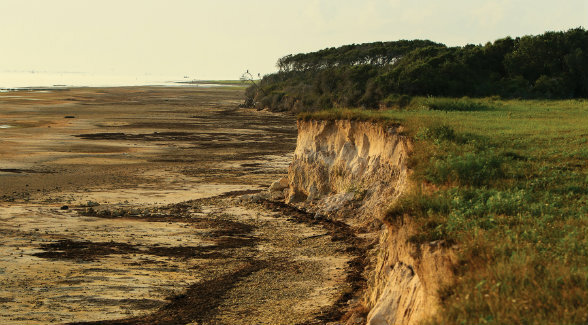 For over a century, the historic holding was operated as a cattle ranch, but its ultimate value lies in its rarefied status as a coastal wetland. Smith points out that more than 200,000 acres along the Texas Gulf Coast have been developed. 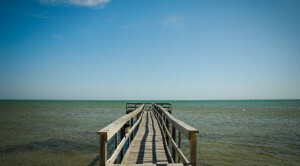 “It’s one of the last of the best of the best, and about as special a place as you’re going to find on the Texas coast. It’s also going to be one of those great conservation case studies as it illustrates the lessons of persistence and perseverance,” he says. In addition to its proximity to a national wildlife refuge, the ranch is located just a stone’s throw from the 19th-century ghost town of Indianola. “Powderhorn Ranch is the hole of the doughnut of many, many decades of conservation work in and around Matagorda Bay and the Aransas National Wildlife Refuge complex,” Smith says. “The place is literally teeming with fish and wildlife. And if you like to wadefish, or canoe or kayak to catch a tailing redfish, or catch a trout or flounder, the bays and back bayous and marshes are going to be the places for you. If you like to hunt, the game there is just simply extraordinary — from deer to ducks and doves and bobwhite quail,” he says. Powderhorn Ranch features more than 11 miles of tidal bayfront on Matagorda Bay. 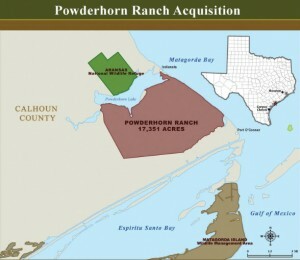 At $37.7 million, Powderhorn Ranch represents the largest amount ever raised for a conservation land purchase in the history of the Lone Star State. In the years to come, the Powderhorn will evolve into a state park as well as a wildlife management area. According to Texas Parks and Wildlife, the lion’s share of the funding came from the National Fish and Wildlife Foundation’s Gulf Environmental Benefit Fund, which was established when a U.S. District Court approved plea agreements resolving criminal cases against BP and Transocean that arose from the Deepwater Horizon explosion and oil spill in 2010. The agreements direct $2.544 billion to the National Fish and Wildlife Foundation (NFWF) to fund projects benefiting natural resources of the Gulf Coast impacted by the spill. To date, the Gulf Environmental Benefit Fund has supported 50 projects worth nearly $390 million. The $34.5 million that NFWF committed to fund the Powderhorn purchase is the largest land acquisition to date. The Conservation Fund and The Nature Conservancy of Texas each provided $10 million in interim funding and were instrumental in pulling the deal together. The Texas Parks and Wildlife Foundation will take title in 2016 and ultimately turn it over to the state. This live oak thicket is typical of the wildness flourishing on Powderhorn Ranch. More than a decade has passed since James King of King Land & Water caught wind of the immense conservation opportunity afforded by the Powderhorn Ranch. At the time, the Texas A&M graduate was employed by The Nature Conservancy. One of his colleagues there was Carter Smith, who would serve as state director of The Nature Conservancy of Texas before being appointed as the executive director of the Texas Parks and Wildlife Department in January 2008. 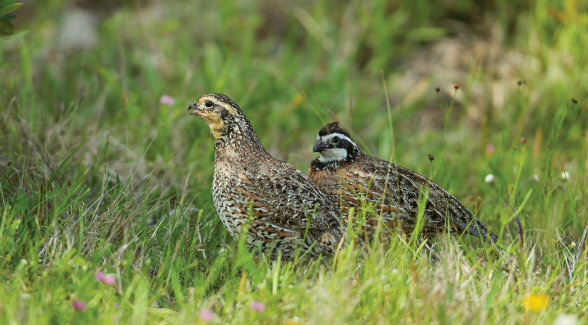 Increasingly rare and enormously valuable, coastal holdings such as Powderhorn Ranch are a haven for game, upland birds, and waterfowl, an attribute that makes the 17,351-acre tract even more appealing as a state wildlife management area. The Texas Parks & Wildlife Foundation is still seeking donations to help fund the Powderhorn Ranch acquisition, which is part of a statewide fundraising campaign called “Keeping it Wild: The Campaign for Texas.” More information on this effort is available online at www.tpwf.org. 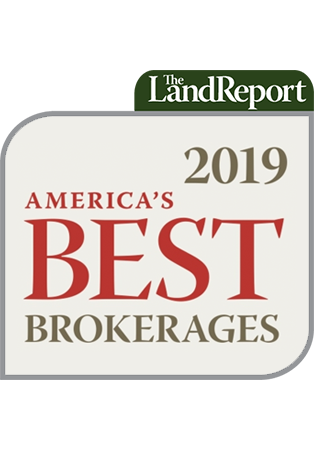 The Land Report 2014 Deal of the Year sponsored by American Timberlands Company.